I’ve been swooning over She Sheds ever since I spotted a charming little cottage in a backyard, which was completely transformed from an old storage shed into a self-care oasis. It was fabulous and it had it all - a sofa, books, candles, and pretty decor. I had to have one. But truly, how many of us have the space and resources to make one of these? We’ve got to get creative! Enter, the Mini She Shed. Which is entirely perfect for all of our self-care rituals, and can be in virtually any quiet corner of our home. This is our go-to mini oasis where we can recharge as moms, and receive a spiritual boost. It’s the perfect spot to seek out when one child refuses to nap and we can’t think straight, or it’s been a long and fun day at the park and all we need is a little quiet spot just to breathe. Creating my own Mini She Shed has been such a game-changer for me in how I feel after a busy day. I started my own with a candle and a journal on my nightstand, and it’s evolved into a small bookshelf in my room full of all of my favorite stress relief things. What makes me giddy: there are no rules for Mini She Sheds. At first I thought I was being woo woo af when I slowly added little statues, spiritual books, oracle cards, and incense (and used to keep it a secret from friends 🤭). But now I'm much more open (it’s a fun conversation starter! ), and find myself more drawn to my space now than ever. This can be YOUR special space to decorate, journal, read a few pages from book, feel the emotions we’ve been holding in, take a few deep breathes, light candles, downward dog, write intentions, stare… or whatever your heart tells you to do! Is there a spot in your home that is more quiet than the others? This is a good starting point. For me, my bedroom is the most quiet, but feel free to get creative and think outside the box. Does your home office, or a spare bedroom, or even a corner of your patio have potential for a Mini She Shed? How about a windowsill? The next step is adding a base for all of your self-care needs. You can use almost any platform as a base. Be sure it’s not wobbly, especially if you plan on lighting candles. Small tables, dressers, nightstands, bookshelves, a windowsill, or stand alone shelves can work really well. If you’re a private person, a linen closet can also be a nice space. Much like the space you chose is unique to you, so is what you choose to include in your she shed. It can be ever evolving and feel so special to make it your own. The only thing to keep in mind - choose the things that genuinely make you feel good. This isn’t what you think “should” be in a she shed, rather, what truly inspires or comforts you. Close your eyes and take a deep breathe. What are you drawn to that brings you peace, comfort, healing, and recharging energy? Your inner guide will know what this is. Begin with a pretty cloth if you’d like, which can make your space look even more appealing. Is there a spiritual statue, like a cross, angel, Goddess, or a Buddha that you’re drawn to? Or perhaps crystals, flowers, special photos, moon calendars, dragon flies, or a certain animal lights you up? I included a small pin of Anne of Green Gables in mine - her freckled face inspires me every time I look at her! If you’re really stuck, perhaps a photo of yourself as a child might be just the thing to awaken a need for joy, healing, and playfulness. Many of us like to go into our she shed spaces in the evening, when our children are asleep. I find that bright lights kill the vibe I want to create. Low lighting feels soothing, and so I have a Himalayan salt lamp, beeswax and soy candles, and twinkle lights I turn on as soon as I enter my space. Sometimes we forget how important scent is for relaxation. If I smell anything artificial, like cleaning products, I feel distracted and even light headed. Lighting a beeswax candle, diffusing essential oils, or lighting incense can soothe us after a long day at home with the kids, or a busy day with a playgroup. What smells help you to relax and unwind? My go to is lighting Palo Santo incense because of it’s natural woody smell, but I also love diffusing lavender essential oils, and the hint of beeswax from a candle. Keeping a journal in your she shed space can be a great reminder to pick up a pen and write! Do you have a journal you write your true feelings in? I’ve shared before that I find journals more healing than even venting to a close friend. There’s something about saying exactly what’s on our minds, without needing to “prove” anything or sugar coat it - that can truly release the grievance. I don’t journal every day. Though I’ll be sure to journal when there’s something bugging or triggering me that I need to feel and release (the waning moon is a nice time to focus on releasing too!) or when I’m setting intentions. I also try to journal what I’m thankful for as often as possible. Spiritual day books are my favorite to read in the morning to start my day, and I keep them close by my mini she shed space. These books are short 1-2 page prose with a special take-away or a spiritual insight. The Bible is an example. My favorites are: The Book Of Awakening by Mark Nepo , Heart Thoughts by Louise Hay, and I’ve Been Thinking by Maria Shriver. If you’re looking for a spiritual practice, A Course In Miracles is my go-to for daily lessons. Do you have a little spot or 2 in your home to take a mini break just for you? My she shed space is upstairs, but the downstairs bathroom is where I can slip away for a few minutes when I’m feeling overwhelmed. This is the place I take a few deep breaths, and talk sweet to myself. You and I can be so alike, and forget to acknowledge how amazing we are as mothers and people. It’s so easy to get down on ourselves, even when we’re doing our very best. What are the encouraging and loving things you say to your best friend? That’s the mindset we need to embody. PS - Sweet friend, What are your favorite things in your mini she shed? If you don’t have one one yet, get started yo! What do you think you’ll include and where will it go? I hope you enjoyed this post! 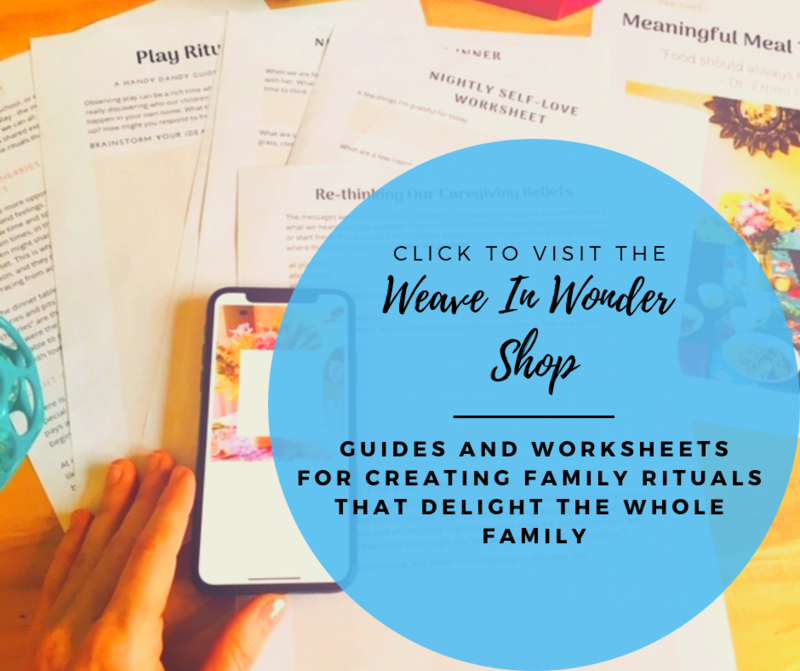 For free respectful parenting + self-care resources and gifts, sign up for the Weave In Wonder newsletter. If you’d like more inspiration, connect with me on Instagram where I share child-led play inspiration and self-care rituals. And if you’d like more direct support and community with like-minded people, come join the Bay Area Whole Child Activities group.